Congressman Bill Pascrell on Saturday afternoon said he voted for councilman Andre Sayegh in the city’s intensely contested six men mayoral race. Pascrell voted using an absentee ballot three weeks ago, he said. He would not reveal his three picks for the 14-person at-large council race. “I’ll be in Washington on Tuesday,” said Pascrell explaining his reason for submitting an absentee ballot. His wife will vote on Election Day, he said. “Obviously, I’ve earned his trust. He is someone I have worked well with in the past and will continue to collaborate with in the future,” said Sayegh. He said Pascrell was able to deliver for his constituents by lobbying Federal Emergency Management Agency (FEMA) to revise the city’s flood map. Homeowners saved thousands of dollars as a result of the flood map revision. Sayegh saw the congressman’s support as a vote of confidence. Sayegh worked as communications assistant and field representative for Pascrell’s office from 2000 to 2004, according to his resume. “I know him. 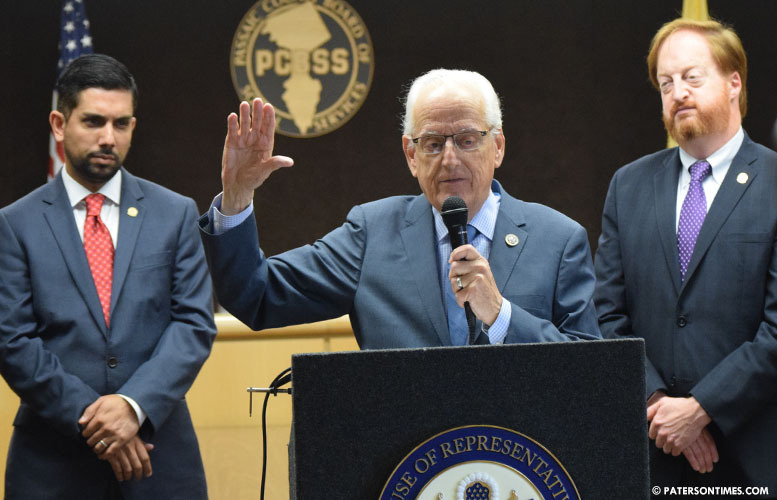 I worked with him,” said Pascrell describing Sayegh as “very conscientious.” The congressman’s son Bill Pascrell III, who serves as the chief attorney for the Passaic County government and is a well-known lobbyist, has raised funds for the Sayegh campaign. Pascrell and Sayegh have known each other for almost three decades. Four years ago, Pascrell endorsed Sayegh on the steps of City Hall with a large contingent of Passaic County Democratic Party leaders. This year, the congressman did not make any public endorsements. “I don’t endorse. I endorsed one time. If you go back in history, I don’t endorse candidates on the local level,” said Pascrell. Pascrell faced a mob in front of the City Hall that day four years ago. Used to being an adored figure in his hometown, he was booed. But, using the wiles he picked up in Paterson politics, he managed to get some cheers, when he told the mostly Hispanic crowd — supporters of disgraced mayor Jose “Joey” Torres — he intended to fight for immigration reform in Washington D.C.
Pascrell has represented Paterson in the House of Representatives for 21 years. He is a former mayor of Paterson. Pascrell said he was pleased with the field of candidates in the at-large race. Back to your Crypt. Pascrell! !